Miratech held U.S. Partner Event on July 22, 2014, at the Ukrainian Embassy at the historical Forrest-Marbury House in Georgetown, in Washington, D.C.. Participants included Miratech partners and customers, and Miratech top management. Attendees included U.S. media representatives, FINCA International CIO Braulio Oliveira, government delegates, members of the Ukrainian diaspora, and other community members who support Ukraine and its people. More than 10 C-level partners and community members participated. The schedule for this exclusive event included seminars, customer-specific strategy development, technology discussions, and plenty of networking. The event offered a prime opportunity to meet other Miratech partners, learn about customer success stories first-hand, spend quality time with our executive team, and develop strategies for long-term business success. Partners will stay overnight in Washington, D.C. on July 21 and 22. Visitors to the city will have the opportunity to see the capital of the U.S. up close. The city, whose population is about 646,500, is home to the centers of all three branches of the federal government of the U.S.: the Congress, president, and Supreme Court. Washington, D.C. hosts 176 foreign embassies. It is also home to the headquarters of a number of international organizations, trade unions, nonprofit organizations, lobbying groups, and professional organizations, including the World Bank, and the International Monetary Fund (IMF). The city is also home to various national monuments and museums, many of which are on or near the National Mall. Visitors can see famous attractions while staying in Washington, D.C., including the Lincoln Memorial, Washington Monument, National World War II Memorial, Martin Luther King, Jr. Memorial, National Archives, Library of Congress, Smithsonian Institution, National Air and Space Museum, and many others. 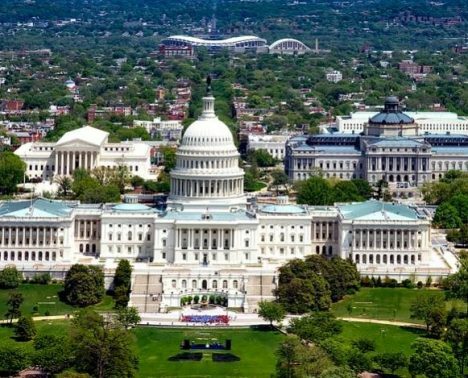 The U.S. capital has a diversified economy that is growing, with many jobs in the federal government, which also supports law firms, independent contractors, nonprofit organizations, lobbying firms, trade unions, industry groups, and professional associations. After the federal government, tourism is the city’s largest industry. Additional industries within the city include education, finance, public policy, and scientific research. Top employers include Georgetown University, George Washington University, Washington Hospital Center, Children’s National Medical Center, and Howard University. Embassy of Ukraine to the U.S.
As close allies, Ukraine and the U.S. depend on each other for support. The best support the U.S. can provide to Ukraine is jobs for Ukrainians, and orders from Ukrainian companies. The Miratech M-FORCE event in and reception at the Ukrainian Embassy will allow Miratech to gain more U.S. partners and strengthen its position in the U.S. market. The two countries cooperate in many areas, including science and technology. An agreement signed in 2006 promotes scientific and technological cooperation between the countries, as well as the exchange of experience, information, and technology in areas of mutual interest. Another area of cooperation is the environmental sphere. The two countries collaborate to fight air pollution, ensure environmental control, develop analysis of health risks pertaining to environmental pollution and radiation emissions, and other critical tasks. Cultural, humanitarian, and regional cooperation are also key to relations between the two countries. The U.S. recognized Ukraine as an independent state in 1991, and diplomatic relations were established in 1992. 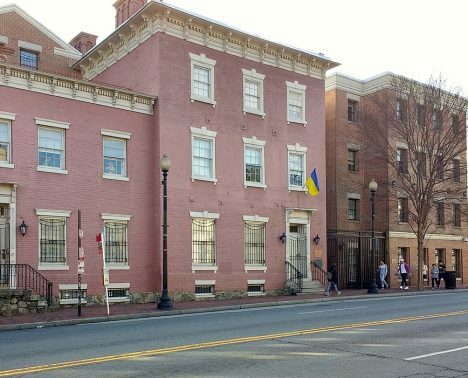 At that time, Ukrainian Embassies were opened in Washington, D.C. and other locations. The first Ambassador to the U.S. from Ukraine was Oleg Belarus. The current Ambassador is Olexander Motsyk, who has had a distinctive career in foreign relations. The location of the Embassy, within the Forrest-Marbury House, is on M Street, a place with close ties to the birth and early growth of the U.S. 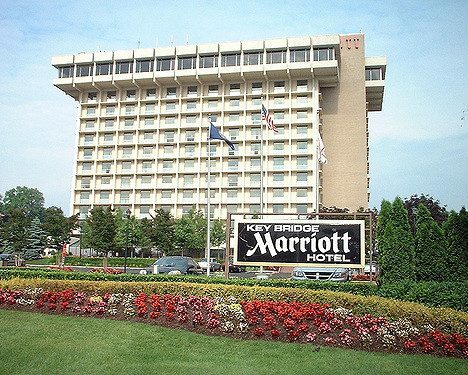 Event attendees may choose to stay at the Key Bridge Marriott Hotel, which is located across the Potomac River from Georgetown. Guests can enjoy panoramic views and convenient access to airports and roadways. The hotel is located within three blocks of a DC Metro system station, which provides easy transportation to national landmarks. The hotel offers tasteful, smoke-free accommodations, including an open lobby with private seating areas, complimentary wireless Internet access, and 17,000 square feet of meeting space. Guests can take advantage of other amenities, including several breakfast selections, a gift/newsstand, and an in-house fitness center and swimming pool. Biking, hiking, and jogging trails can be found nearby, as well as places to golf, or go horseback riding, bowling, or rock climbing. Dining is available in two restaurants within the hotel, the casual Revival, featuring classic American food with a modern interpretation. Connexion offers the opportunity to stay connected while having lunch or dinner from the eclectic menu; guests can enjoy flat panel HD TVs and complimentary wireless Internet access. Room service is available from 6:00 AM to 12:00 AM, and many other excellent dining options are available in the surrounding area. Business travelers can get their needs met with a full-service business center, and various business services, including copying, faxing, and delivery/pickup. The hotel’s business meeting rooms include high-speed Internet, audio-visual packages, and stylish meeting spaces, as well as spectacular views of Washington, D.C.
1789 Restaurant buys from local farms, bypassing traditional commercial produce routes. Its produce is always fresh and of the highest quality. It also sources much of the meat, fish, and poultry it serves directly from their native regions. The restaurant It includes six dining rooms, each with an elegant setting, decorated with American antiques, period equestrian and historical prints, and Limoges china. The John Carroll Room encompasses Currier and Ives prints from the days of George Washington, early maps of the city, and images of Georgetown University. The Middleburg Room includes architectural features such as a ceiling sheathed in barn siding from the New England countryside dating back to the 1800s, and massive beams from a post-and-beam home in Vermont. The bay window at the east end of the room overlooks Prospect Street and residential Georgetown. The floor-to-ceiling windows in the Garden Room, along with the floral prints decorating the walls, make the room light and airy. Finally, F. Scott's is an Art Deco room named after author F. Scott Fitzgerald—the embodiment of the sophisticated, high-living style of the Jazz Age. Participants of the M-FORCE seminar, including VIP guests, such as the Ambassador and government officials, will enjoy dinner on July 22nd at Sea Catch Restaurant, which is known as one of the best and oldest seafood restaurants in Georgetown. The restaurant, open for 25 years, offers the finest seasonal seafood in a friendly environment. The location includes a raw bar—a 31-foot white marble bar from which customers can enjoy mussels, clams, oysters, shrimp, or house-smoked salmon. The long bar is a 42-foot oak bar for oyster happy hours. The café provides al fresco dining overlooking the C&O Canal. The 120-foot deck offers an outdoor dining experience and leads to the towpath of the Canal. Finally, the Chesapeake Room features a stone fireplace, canal views, and rich wood paneling. Prior to becoming a restaurant, the location within the Canal Square Building was used as a shipping warehouse for barge traffic on the C&O Canal. In 1892, the structure was converted into a factory. The manufacturing company eventually merged with two others to form International Business Machines Corporation, otherwise known as IBM. In cool weather, the setting is cozy, featuring a romantic stone fireplace, deep colors, and rich, dark woods. In warmer weather, the deck overlooking the C&O Canal offers a refreshing experience. In any season, the Sea Catch Restaurant offers delightful dining. Signature dishes include Jumbo Lump Crab Cakes, Fresh-Caught Fish, and Live Maine Lobster. The menu changes each day, and includes a number of entrees for a variety of customer tastes.